How is noise correlated in CASA when mstransform and tclean are used? Below is a short explanation for how noise is correlated in CASA with mstransform and tclean, and attached is a PDF file with more detailed information. The link to the attachment is at the end of this article. If one takes independent channels, and interpolates between them, one obtains correlated channels. An output channel exactly between two input channels will have sqrt(2) less noise than the input channels, whereas an output channel precisely aligned with the input channels will have the same noise as the input channels. Thus, noise in an image can vary from channel to channel, in the worst case between the expected noise level and 1/sqrt(2) of that level. 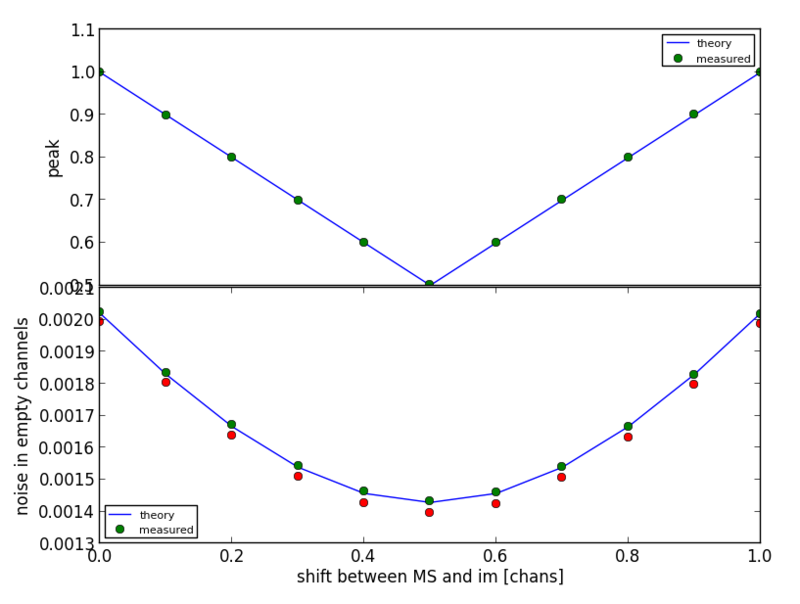 This plot again shows the noise in an image channel, as a function of shift between the image and visibility channels, but now for simulated ALMA data in which the visibilities have been online-averaged by 2 channels. That online averaging leaves the visibility channels moderately correlated, so the interpolation effects on noise are not as pronounced as for completely independent visibility channels above, but still varies by 20%. Finally, this plot shows the per-channel noise in an image created from simulated ALMA visibilities with online averaging of 2 channels, but as a function of image channel width. The greatest variation of image channel noise is for image channels equal to the visibility channels (x=1), in which the noise varies between the expected (radiometer equation or sensitivity calculator) noise level and 20% lower than that. The channel-to-channel noise level variation is also high when the image channels are slightly less than twice the visibility channels – noise in the image channels in that case varies between expected and 20% higher.